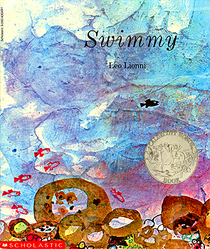 Swimmy is a children’s book written by Leo Lionni about a lone black fish named Swimmy who finds new sea creature friends after his school of red fish friends is eaten by a big, scary tuna fish. This story fits with September’s theme of friendship because Swimmy’s journey is about finding new friends when old ones are gone. It’s not that Swimmy isn’t liked – Swimmy’s friends are swallowed! But the resilient black fish manages to find new underwater buddies after searching the sea alone. With these new fish, Swimmy devises a plan to all swim together like one big fish, with Swimmy acting as the “eye”. They succeed in scaring away the big tuna. One thing that parents can do is show the pictures in the book to their child and then ask them what each sea creature is. When Swimmy is alone and trying to find a new school of fish to hang out with, there are illustrations of a lobster, an eel, seaweed, a jellyfish, and more. This could be one fun way for kids to learn some sea animal/crustacean names, and what they all look like.